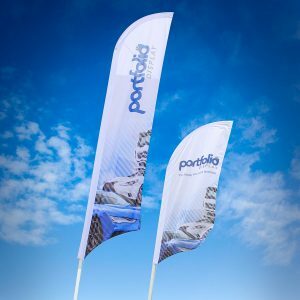 The new forecourt feather flag poles are designed to be heavy duty, for regular use out on the car forecourt and come available in 2 sizes: 3.3m and 5.3m. You position them under the cars wheel and are suitable to be used out on the forecourt as well as outside at events. They are versatile enough to be used on all ground types, soft or hard, as long as they are trapped under the vehicles wheel, using the base plates supplied. 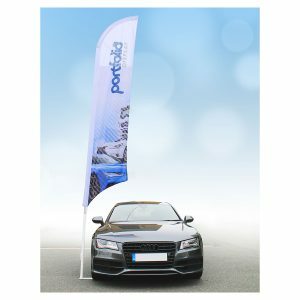 Feather flag poles are not used as permanent fixtures as quite often they are used as a temporary or semi-permanent solution for display and advertising. This gets round any planning permission issues you may encounter from local authorities. The curved arm and white powder coated Aluminium poles make them elegant and attractive to the eye. They offer a great advertising space, without being too obtrusive, perfect for when space is at a premium.